If all the water in lunar rocks were put together, it would more than fill the Great Lakes, a researcher says. 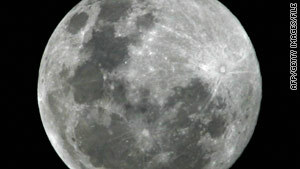 If all the water were on surface, "it would cover the moon in about a meter-deep thickness"
Atlanta, Georgia (CNN) -- There is a greater amount of water on the moon than previously thought, and it is probably widespread within rocks deep below the lunar surface, a group of scientists says. Recent missions have found water and ice on the moon's surface, which could have been carried there by giant molecular clouds or bits of comets. But in a new U.S.-led study published in the Proceedings of the National Academy of Sciences on Monday, the scientists not only concluded that water may be "ubiquitous within the lunar interior," but also "indigenous to the moon." "For over 40 years, we thought the moon was dry," said the lead author of the findings, Francis McCubbin of the Carnegie Institution of Washington. "We found that the minimum water content ranged from 64 parts per billion to 5 parts per million -- at least two orders of magnitude greater than previous results," he said in a statement. There is so much water within lunar rocks that if all of it were extracted and put together, it would be more than enough to fill the Great Lakes, McCubbin told CNN.com. Another way of looking at it, he said, is "if we were to put it over the surface of the moon, it would cover the moon in about a meter-deep thickness." So would all that water be able to support life on the moon? Not quite, McCubbin said. The water is mostly incorporated within the rocks deep within the moon. Most scientists believe that the moon was formed when a Mars-size object hit Earth about 4.5 billion years ago, knocking off rocks and debris that eventually fused to form the moon. Hot magma, which contains water, was formed during that process. While it was believed that most of the water evaporated, some water molecules stayed as the magma cooled, McCubbin said. He and his team examined lunar rocks collected about 40 years ago from Apollo 14's and 15's moon missions, and from a lunar meteorite found in Northwest Africa. They focused on a specific water-bearing mineral of the rock and studied hydroxyl, or OH, a chemical compound in the mineral that contains one atom of oxygen and one atom of hydrogen. "If we find OH in the minerals, it means water was dissolved into the magmas of the moon," McCubbin said. Their findings showed that there was a lot more water stored in lunar materials within the moon's interior, and also suggested that water is native to Earth's only natural satellite. "The concentrations are very low and, accordingly, they have been until recently nearly impossible to detect," lunar scientist Bradley Jolliff of Washington University in St. Louis, Missouri, said in a statement. "We can now finally begin to consider the implications -- and the origin -- of water in the interior of the Moon." While the water doesn't mean life on moon, McCubbin said, it may help scientists "understand how life may have started on Earth, which is still a topic we know very little about."